News and announcements about our products and how to get them. 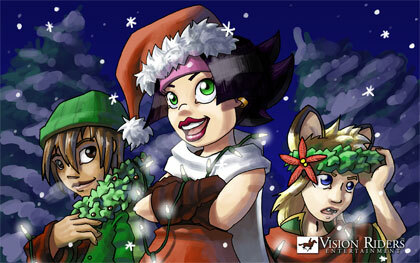 This is the wallpaper that will be included in December’s download pack here soon. Their eyes are bigger than they really should be (if I’d caught it when I should have, I could have fixed it), but otherwise it came out surprisingly well. The characters pictured are (from left to right) the kid from My Brother, Jessie from Swordmaster Odyssey, and Iccari from… well, he’s not really from anything yet. Line art was done with a #2 pencil (I should have gotten my pens out so I’d get more line variation), and everything else was done in Photoshop CS. This wallpaper’s download pack should be up by Friday. We are proud to introduce our new digital download packs! Released each month, every download pack contains a desktop wallpaper (in both 16:10 widescreen and 4:3 formats) along with other extras. The extras range from additional images to exclussive commentary to music files, and each pack retails at an even $1. Although these replace the old Swordmaster Odyssey download packs, don’t worry. You’ll be able to buy the high-resolution versions of the webcomic along with commentary again in the near future. Sales from these download packs help support our hosting costs and allow us to continue creating new and entertaining content for our site! Hosting the site and creating Swordmaster Odyssey and our other upcoming projects is not cheap, so please consider supporting us by buying a download pack to enjoy. You may have noticed that you can’t buy anything from the Vision Riders Store right now. The digital download sales for individual chapters of Swordmaster Odyssey have been pretty dismal thus far, so we decided to halt production of them. They’ll be replaced with a full “books” of chapters in the future. Hopefully this will prove to be a better deal for you, since that seems to be what most people want instead of downloading the chapters one at a time. The new digital download packs will include new commentary that’s easier to follow and, hopefully, more insightful. If you’ve already purchased one of the digital download packs, you’ll get a discount on the Book 1 download pack when it comes out. Just email your original order number to us and wait for instructions. As a side effect of low sales numbers and the removal of the old download packs, we’ve had to bring back banner ads on the Swordmaster Odyssey page. They’re annoying, I know, but they do generate a small amount of income that can help pay for hosting the site. I would like to do T-shirts in the near future–if only because I want one! 😉 If you have any suggestions for what kind of T-shirt you’d be interested in, feel free to contact us or simply leave a comment on the blog. By the way, I hope to have time on Thursday to talk a little bit about our upcoming project, “Procyon“. First off, you may have noticed that we’ve dropped the price of our download packs to $0.99 Don’t know if the drop is permanent yet, so grab Chapter 1 while you can. In any case, we’re pushing the release of Chapter 2 back to October 3rd (next Wednesday) in order to give me enough time to finish the commentary and other extras. We hope you look forward to it!